Spider-Ham's World: McDonalds is Giving PHP 50,000 Everyday! 1. Promo period is from Nov. 16 to Dec. 15, 2011. 2. Order one (1) Extra Value Meal with any Coke product via McDelivery. One Extra Value Meal with Coke product = one raffle entry. A customer can order as many Extra Value Meals per transaction to earn more raffle entries. 4. The Extra Value Meal should come with the following drinks: any regular (12oz), medium (16oz) or large (20oz) size of Coke, Coke Light, Coke Zero or Sprite; Nestea Iced Tea, Eight O'Clock Orange Juice and Coke McFloat. 5. Promo does not include Breakfast Meals orders between 3:50AM and 10:20AM, McSaver Meals: Crispy Chicken Fillet Meal, Crispy Chicken Sandwich Meal, McSpaghetti Meal or Extra Value Meal with Pineapple Juice as drink. 6. Customer order should be placed within the McDelivery Website, Call Center (8-6236, 34-86236, 22-86236, 87-86236, 62-86236 and 77-86236) or SMS (0917-5116236 Cabanatuan only) to qualify. 7. Daily raffle draws will include valid transactions received until 11:59pm of each day within the promo period (Nov. 16 to Dec. 15, 2011). 8. The electronic raffle draws will be held at Starcom MediaVest Group Office, 25/F Tower 2, The Enterprise Center, Paseo de Roxas corner Ayala Avenue, Makati City. 9. There will be a total of 30 winners during the promo period, 1 winner per day for 30 days. Each daily draw winner will get fifty thousand pesos (P50,000). The applicable withholding taxes will be shouldered by Golden Arches Development Corporation. 10. 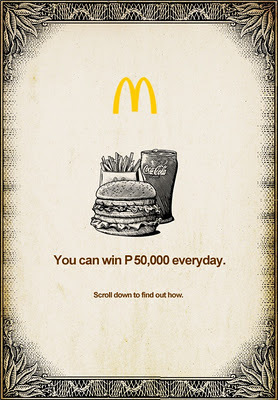 Daily winners will be posted at facebook.com/mcdo.ph. 11. The winner will be notified through a phone call and registered mail. To claim the prize, the winner must present the McDonald's registered mail and a valid ID (ie SSS ID, company ID, driver's license, passport). The winner should also provide a TIN number for the purpose of remitting taxes to the government. 12. Winners may claim their prizes after 10 working days from the receipt of the registered mail. 13. Metro Manila winners can claim their prizes at Starcom MediaVest Group Office, 25/F Tower 2, The Enterprise Center, Paseo de Roxas corner Ayala Avenue, Makati City, during office hours only (10am-12nn and 1pm to 5pm). Furthermore, winners cannot claim prizes during Non-working Holidays. Unclaimed prizes by February 15, 2012 shall be deemed forfeited. For provincial winners, prizes will be sent to the delivery hub who serviced the customer/winner. The McDonald's Restaurant Manager will issue the check to the winner. 14. The prizes are non-transferable. 15. All prizes not claimed by Feb. 15, 2012, 5pm, will be forfeited. 16. Employees of Golden Arches Development Corporation, their branches, advertising, PR and media agencies, call center, suppliers and contractors and their relatives up to second degree of affinity or consanguinity are disqualified from joining the promo. 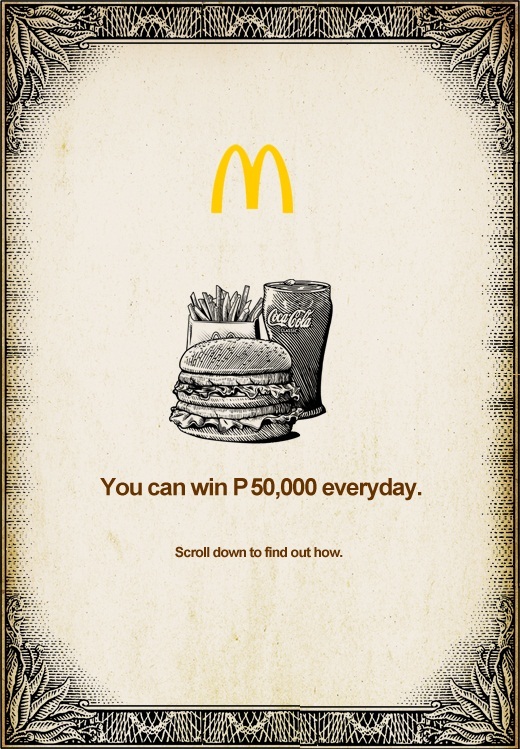 Click here to see who became PHP50,000 richer today.